When you have smart home devices, your house can help with many of the tasks of everyday living. Instead of fumbling for the keys in the dark, your home can lend a hand by turning the lights on for you. And instead of your house being a sauna in the summer when you’re coming home from work, your air conditioning can turn on just in time for you to step into refreshing coolness, without wasting energy when no one is home. Door sensors can tell if something is open or shut and then send you an alert on your smartphone. Place it on your front door to be alerted when your kids get home from school. Or use it to secure your home office, the wine cellar or even the cabinet where you store the cookies to literally catch your kids with their hands in the cookie jar. Smart outlets essentially give you a virtual switch that you can flip using an app or program to turn on or off any plugged-in device. Imagine being able to turn on your coffee maker from the comfort of your bed in the morning, turn off the TV in the living room when dinner is on the table or check to make sure your curling iron is off after you’ve already left for the office. Not only can smart light bulbs be set to turn on automatically when you need light, they also provide the best light for the time of day. At night, you can set the hue of your lights to tune out the harsh blue tones that make it hard to go to sleep, and then turn them up in the morning to help energize you. Or, coordinate your lights to go on when your alarm goes off. Your smart assistant will let you know if you need to pack an umbrella and when to leave based on the current traffic so you get to work on time. It answers your questions, plays your favorite tunes and enables you to easily interact with your smart home devices using simple verbal commands. You’ll wonder what you ever did without one. Cool in the summer, warm in the winter, your smart thermostat makes sure your home is the perfect temperature when you’re home, and saves you money when you’re not. If you’re looking for additional savings, your thermostat can gently encourage you to adjust to a more eco-friendly temperature – one that’s warmer in the summer and cooler in the winter. You can also use your smart thermostat to automatically let other devices know when you’re home or away; so, your thermostat could turn off the lights if you forget to when you leave. Does thinking about your home in a new way make you think about buying a new home? With Capital One’s Simply Smarter Home Loans, the process of financing your new home is simple. Within minutes you can get pre-qualified for a home loan, with no impact to your credit score, so you can make informed decisions when shopping for your next home. And, when you need help, you’ll have the support of a dedicated home loan officer that’s assigned to assist you with the mortgage process. 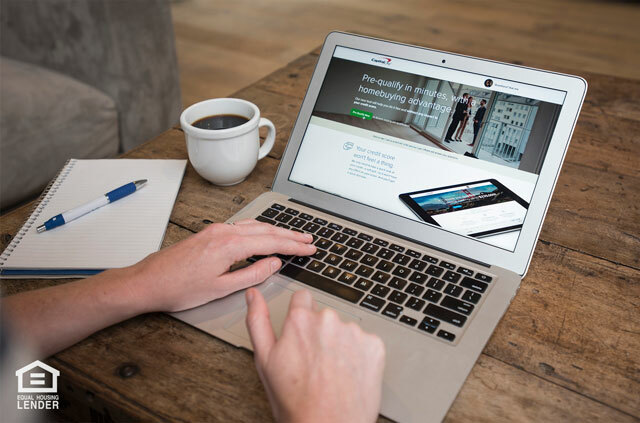 Capital One gives you the tools to be able to track your loan progress anytime and upload and sign documents electronically. Think you know enough to buy a home? Take the Capital One Simply Smarter Home Buying Quiz and find out! 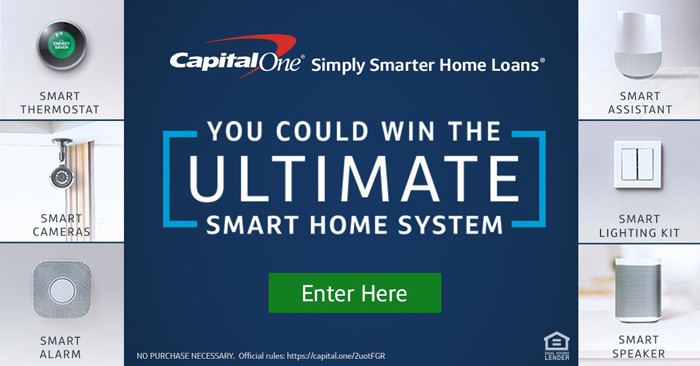 In addition to providing customers with a smarter way to buy and refinance their home, Capital One Home Loans is giving away the ultimate smart home systems, with lighting, cameras, thermostat, security features and a smart assistant in theSimply Smarter Home Sweepstakes. One Grand Prize Winner and two First Prize Winners will be announced weekly, now through August 21, 2017.